Family life (Dadseye view :0), a photo by Davidap2009 on Flickr. 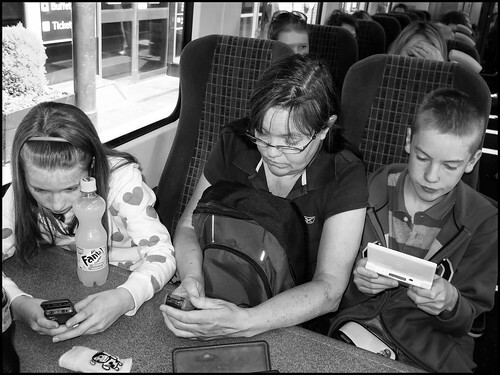 Family Life.I took this in 2008 with my then with a Canon G9. We were on our way to London for the day. On Saturday my wife and I purchased some tulips to add some colour to our living room. I noticed how the early morning light brought out the subtle textures and the delicacy of the flower. I was up early on Sunday as my wife had an early shift and had gone to work. The Teens were still in bed. And I was looking for things to do. I looked at the Tulips while I munched my cornflakes and got an image in my head of how I’d like to shoot them. The early morning light was soft and reflected from our terrace by the thick layer of snow still lying there . As I knew how I wanted to shoot the Tulips it was just a case of getting the reality to match the vision. That’s where it usually goes wrong for me. However, ever the optimist I felt that things would be better this time. I knew the film I wanted to use and how I wanted to develop it. 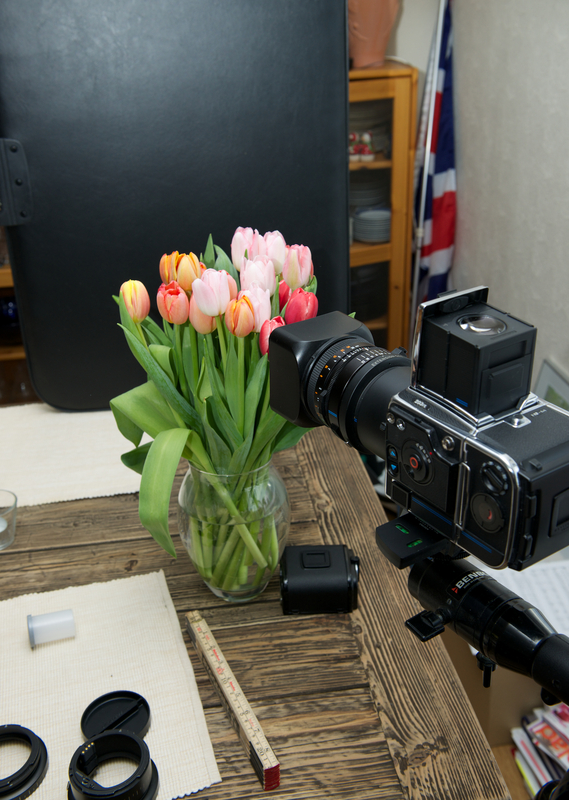 I set my Hasselblad 203FE on a borrowed Benbo tripod using a Hasselblad quick release plate. I then loaded the film I wanted to use, Rollei 80s. My table top set-up was very simple Just a plain background (Jig-saw Puzzle carrying case) and natural light from the window. The lens I used was the Carl Zeiss Planar 80mm F2.8 , Using a different extension tube for each series of shots . I let the Hasselblad decide the metering and for want of a quick release I raised the mirror and then used the self-timer set at 2 seconds to take the exposure. It’s easy with the 203 you just pull the pre-release once to raise the mirror and once again to set the self -timer in action. I use a slightly different recipe from the one I give on my Caffenol page using less Washing soda and 1 gram Potassium Bromide. (If you live in the UK you can buy it as I did here. )This prevents the film from fogging and helps if you are getting un-even development. Being lazy after all it was Sunday morning I chose to stand develop this film. Once in the tank pour in your prepared soup agitate for the first minute and then leave to stand for 49mins (Just enough time for bacon and eggs and a little light reading). Stop with ordinary plain water. Fix for 5 mins (I used Kodak T-Max) and rinse for 10 mins . I air dry my negatives for about 5 hours it varies with the temperature in our laundry room. I scanned the negatives with my Epson V700 Scanner using a Betterscanning holder and anti newton glass to flatten the negatives. I use Silverfast SW for the scanning work I then import to Aperture and tweak in Silver Efex Pro 2(Very little tweaking was needed with these negatives. Here’s the result click on each for a larger version. That was my Sunday How was yours? 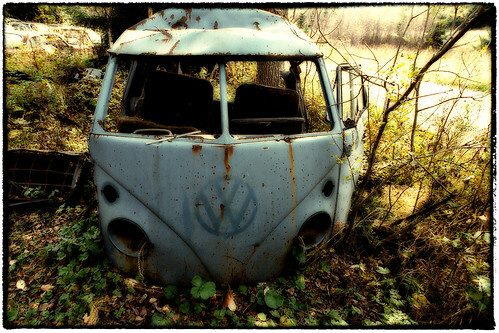 VW Sheds a Rusty Tear, a photo by Davidap2009 on Flickr. Its Been A Long Time., a photo by Davidap2009 on Flickr. 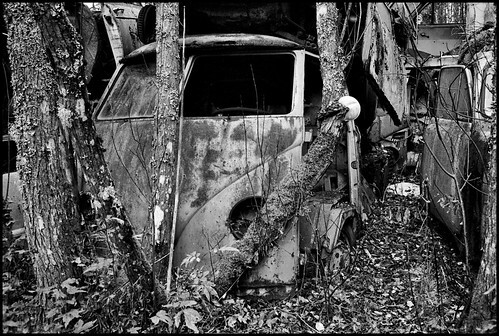 To Give you some idea of just how long this VW has stood here look at the wing mirror grown into the tree. The arm has rotted away you can still see the impression.. 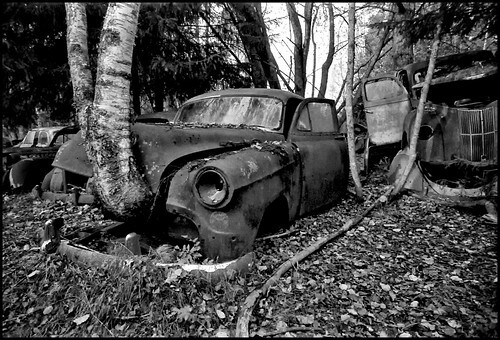 Car Cemetery III (Explored. ), a photo by Davidap2009 on Flickr. Todays shot: This I shot on my trusty F4s with my Nikkor 20mm. The film I used was Rollei RPX400 which is new to me. I used Caffenol C-L Semi-stand for 55mins with gentle inversions at 2,4,8,16 and,32 mins. Which gave a much better result than the 70mins I tried before(Thanks Eirik) . This shot is my fav of the day so far. I just love the way the tree has grown through the car. 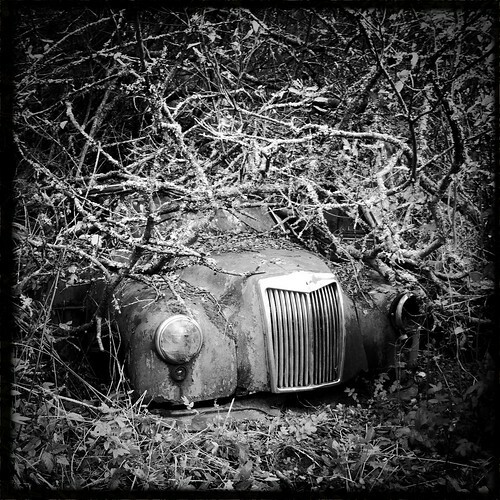 The Car looks quite sad as if it’s pleading for help to remove it . The Car Cemetery (Explored), a photo by Davidap2009 on Flickr. Welcome to the Car Cemetery. Just over an hours drive from my home, just inside the Swedish boarder lies one of the most fascinating places I have been. 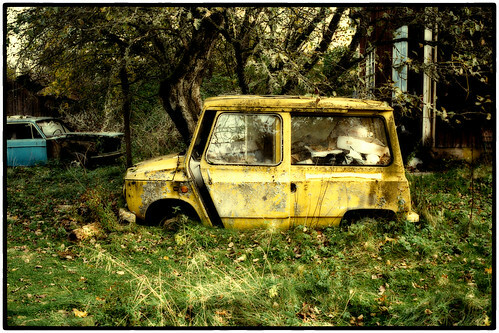 A Car scrap yard which has become a Cemetery since everything has been left to nature. To begin the series I thought This iPhone shot would make a great start. I took this shot in 2006 with a Sony digital compact. It’s been my avatar on Flickr since the first day I started there. It’s part of the decoration on the cathedral in Trondheim. It’s by one of my Favourite Sculptors. Gustav Vigeland. Abandoned Sanatorium, a set on Flickr. This old sanatorium was built by St. Jorgen Foundation in Bergen. It should serve as a tuberculosis hospital for the West Coast. Most patients came from the Bergen region, but there were patients from all over the country. The sanatorium was in operation until mid 1950’s. The background for building the sanatorium here was said to be it’s dry climate, pine forest and the thin mountain air. It was a recipe believed in the old days to cure people with tuberculosis. On this location they found a whole “package” – it was located on a hill and in a climate that one at the time considered “immune zone” against the disease. In the year 1900, the plans for the sanataorium were ready. The three story hospital would have 96 beds and modern spa and operating room. An extension was built in 1924 and the capacity increased to 120 beds, and by 1950 it had reached 150 beds. The construction plan in 1900 included also a separate laundry, stable and icehouse – and not least an electrically driven cable car from the steamship pier at the fjord and up to “rock shelf”. There would also be built a 6 km stretch of road with 13 bends up the hill. The cable car and the power plant to the sanatorium are located in side buildings next to the sanatorium. Calculations showed that the large hospital facility would cost 456,000 norwegian kroner (approx. $76000 – an enormous sum in those days. Most of the money was acquired in Bergen: Bergen city guaranteed for 200,000 kroner, and wealthy citizens for 175,000 kroner. The final amount turned out to be 777,000 thousand kroner when the plant was inaugurated on 2 in November 1902. At the opening party there were greeting telegrams from both the Swedish-Norwegian King and Queen, Parliament President Carl Werner and shipowner and later Prime Minister Johan Ludwig Mowinckel. Some years later, there was also built senior housing, two family dwellings for the stoker and the gardener, and “sister house” for nurses. there were also a separate chapel with mortuary. The first treatment they had to offer – before the vaccine against the disease came after World War II – was partly operations – partly different cures. One of the cures they used here was making sure the patients got enough air daily. Meaning they would lay outside in their beds in both in summer and winter, well-packaged in bags of reindeer skins. They were placed under a huge canopy along the entire south wall and this canopy prevented rain and snow from entering their air spaces. Around the hospital they built a large park with roads where patients who were strong enough could exercise. Another cure they used was known as ‘Blowing of the lungs’. This took place inside the ‘operation lodge’. The technique comprised much of the so-called “blowing”. When tuberculosis attacked the lungs, it would eat the tissue, consume it so that it formed large cavities in the lung tissue. It was essential to close these cavities. This was done by puncturing the lung where the cavities had formed so that sick lung would collapse and the wounds would be healed exactly where the cavities formed. Every July a rich man in Bergen would send a cargo of oranges to patients and staff. The distance down to the village, the risk of getting infected abd the fact that most patients were visitors, not locals – turned this place into a rather secrete and closed society. The sanatorium even had its own post office and therefore the people here would establish a separate social life. The whole complex was built in 1902 so that women and men were strictly separated. There were two bed suites, operation and cure rooms and separate dining rooms for each of the sexes. This separation of the sexes was kept strict up to a major rebuild that was done in 1937. Although there were strict gender segregation indoors, it was allowed for girls and boys to come together on the romantic paths in the park, as well as in the decorated assembly hall when it was organized parties, cinema, concerts or theater. Most of the patients here was young people, and those who were fit enough, would take part part in simple sports activities and games in the park outdoors. It was founded to concerts, and patients set up plays every New Year’s Eve and may 17. (Norways independence day) After rich shipowner and other rich people in Bergen gave the sanatorium a film apparatus in 1937, they had cinema once a week. The sanatorium is now shut down. In the fight against tuberculosis there was a breakthrough – it happened just after 2 World War II. Then came effective vaccines against the disease, and a large part of the Norwegian population were vaccinated against tuberculosis in a few years. Thus has the foundation for the operation of the sanatorium gone. But others took over the buildings and between 1950 and 1990 it was used as a psychiatric hospital. After that, it was used as a reception center for refugees from the Balkan war.In 1994 the doors were closed and the sanatorium has been left abandoned since.